I will enter a description of the blog. 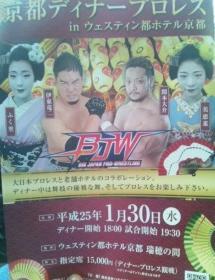 Your coming to Japan Pro Wrestling's first major tournament Kitasenju, Thank you very much for yesterday. In the snow, thank you very much you come to a lot of people. I did not think the snow is piled so. Transport is also chaos. I was training with the rubber tube arm yesterday. I watched a movie called steroid United States. This documentary film. Of course, it is not that yours truly were dosed steroids. However, I will study in a variety of thought-provoking movie. It is quite natural, but yours truly believe this is an occasional steroid use. I think each person to use a steroid or bad or good according to the values. When the old days, professional wrestling Dainippon made ​​a performance at the Yokohama Arena, were invited players Terry Funk, at that time, after the game, did you think that yours truly would not use steroids absolutely, the waiting room of the players Terry Funk be heard is called, and whether you are a steroid medication, yours truly is because they do not use steroids, I do not answer. I was told that players such as Terry Funk dosed absolutely ahead. Salad days, I was told the same thing to Abu Dora The Butcher players. I do not even try to be ahead of steroid medication because there are memories that are large senior tell us a great big pile yours truly do not think I want to become more and more want to build muscle. Yours truly is not intended to deny the steroid separately because it is the difference in values. There was also in the movie, There are various and can say with steroids to bite, to those who are burdened with severe illness is a drug required, it seems there may be side effects in the vitamin. He said much probability of developing mental disorders that Roidoreiji steroid addict has fallen even lower. I felt that the thing that finally yours truly felt watching this film that also prohibit any that it can not, it can not live on their own if they also forbid any. This movie Watcha Gonna Do people perhaps? What would you do? I thought it would appeal the fact that I wanted. If you are interested I think I would like you to see. This is to inform you. In a large Japan Pro Wrestling is looking for a theme song for each player. There are also plans to remake the theme song of yours truly. If I have a person who can make, thank you because it is recruited in large Japan Pro Wrestling. Maiko is a collaboration of professional wrestling and notー. By all means, please come to contact with Japanese culture everyone. Thank you for your attention.